Today, in the rail market, there are multiple ICT (Information and Communication Technology) solutions for managing safety in the traffic infrastructure, especially in high-traffic density and high-speed railway lines that require safety levels and high reliability. In the particular case of rail infrastructures, these systems are integrated in the TMS (Traffic Management System) and the ATP (Automatic Train Protection) systems. The infrastructure for these systems is expensive to install and maintain and requires long wired installations, increasing the costs and resulting in systems being exclusively dedicated to the great railway lines. The focus of this work package addresses the deploying of a wireless Trustable Warning System for Critical Areas that suffer from Safety deficiencies. 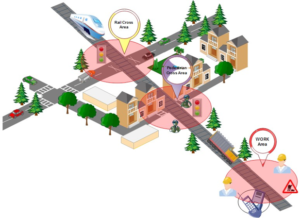 The CATWS (Critical Areas Trustable Warning System) will allow to connect different actors: On-track WSN sensors in the critical area, nearest trains and vehicles (provided with an Onboard CATWS gateway (GW)), and CATWS-local external systems (screens, panels, voice systems, etc.) through the Ontrack CATWS GW in a reliable and safe way. 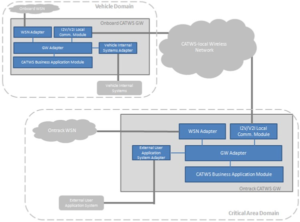 The Ontrack CATWS GW gathers relevant information from the vehicles in the neighbourhood, processes it, and sends the related warning signals to the external systems and vehicles. Increasing the safety conditions in the area by broadcasting problematic or important information associated to specific points in the route of the vehicles that will allow them to take the necessary actions in advance. Improving the compatibility with any existing and future communication protocol to support the information exchange between the different actors, and offering multiple benefits and progresses to the market. Ensuring interoperability with previously installed systems in other sectors (apart from the Rail sector) and being compatible with the existing infrastructure. Providing more scalable architectures, control capabilities to the edge and distributed management. By means of the proposed solution, zones such as level crossing, road crossing, works zones, etc. could be protected without using traditional cabling systems.